WILKES-BARRE (PA) – Delaware Valley University reached the end zone on its first seven drives of the game as the 14th-ranked Aggies downed host King’s College, 49-14, in a Middle Atlantic Conference (MAC) contest. The win lifted DelVal to a perfect 3-0 record, including 2-0 in conference play, while the Monarchs slipped to 1-2 and 1-1. Six of the seven drives took place in the first half as the Aggies built a 42-0 halftime lead for the second week in a row (42-0 over Misericordia on September 9, en route to a 49-7 win). They took advantage of a short field as five drives were 45 yards or less. DelVal’s first possession began at the King’s 37-yard line thanks to an interception by linebacker Nick Wright. A 27-yard pass from Dashawn Darden to tailback Devauntay Ellis set up a first-and-goal situation. Three plays later, Robert Cleveland was in the end zone from a yard out. Nick Restaino added the extra-point for the 7-0 lead just 4:55 in. The Monarchs were pinned back on their next drive and went three-and-out with the Aggies taking over at the King’s 42. Ten players later, Darden found Mike Jensen for a two-yard touchdown and a 14-0 advantage with 5:21 left in the opening quarter. DelVal had to go 55 yards on its next possession and did so on 15 plays. It converted one fourth down play on the drive and Ellis later hit the end zone from a yard out early in the second quarter. Wright put DelVal in great position again as, on King’s first play after the Ellis touchdown, he grabbed his second interception of the game, this time at the Monarch 38-yard line. The Aggies needed just six plays to find paydirt as Darden and Jensen teamed up for a 26-yard touchdown. Restaino’s fourth extra-point gave DelVal a 28-0 lead with 9:30 left in the first half. King’s was forced to punt again and a bad snap on the attempt resulted in a 16-yard loss and DelVal with the ball at the Monarch 12. Two DelVal penalties moved the ball back to the 42-yard line, but the Aggies gained 29 yards on two pass plays to put the ball at the 13. Cleveland took care of the rest for his second touchdown of the afternoon and a 35-0 lead with 5:56 to go before the intermission. DelVal got the ball back at its own 23 a minute later and proceeded to march 77 yards on nine plays. The last yard came from Ellis as time expired in the half. The first team offense played one series in the second half and they took the opening kickoff and went 64 yards on nine plays. Tyler Bing capped it with a two-yard scoring run. King’s picked up its points on a nine-yard touchdown pass from Zach Whitehead to Mike Palmer in the third quarter and an Alvonte Thompson three-yard scoring run in the fourth. 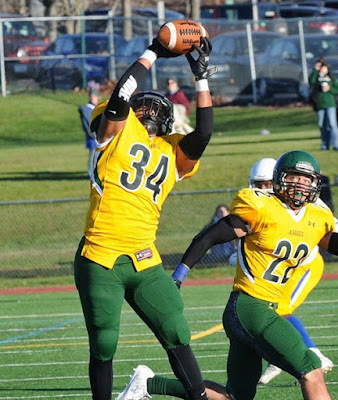 DelVal dominated the statistical battle, including the ground attack as the Aggies racked up 278 yards on 61 carries compared to just two yards on 16 rushes by the Monarchs. DelVal finished with 440 total yards and held the ball for more than 45 minutes (45:32) while King’s had 125 yards of total offense. Darden completed 11 of 19 passes for 121 yards and two touchdowns while also rushing seven times for 49 yards. Jensen caught three passes for 41 yards and the two scores. Cleveland had 71 yards and two trips to the end zone on 12 carries while Ellis had 45 yards and two scores on 11 touches. Wright had the two picks and one pass breakup on the defensive end. King’s quarterback Zach Whitehead, who was coming off a school-record 421-yard passing performance at Lycoming, was shut down by the Aggie defense as he completed just 11 of 24 passes for 91 yards, one touchdown and two interceptions. Bruce Damon led the defensive effort with 17 tackles and one sack. DelVal returns home for a meeting with defending MAC champion Albright College on Saturday, September 24 (1 p.m.).